Place all ingredients in a medium bowl and toss to evenly distribute all ingredients. Prepare a charcoal grill according to manufacturers' instructions. Place the vegetable mixture in a grill basket and cook, turning occasionally until the vegetables are fork-tender, about 10-20 minutes. Pour back into the original bowl and toss again. Serve immediately. My favorite grilling days are the ones where I can make the whole meal on the grill at once. This time we grilled boneless, skinless thighs we marinated in teriyaki marinade spiked with chile-garlic sauce and onions for sandwiches while we made this speedy, spicy side dish. 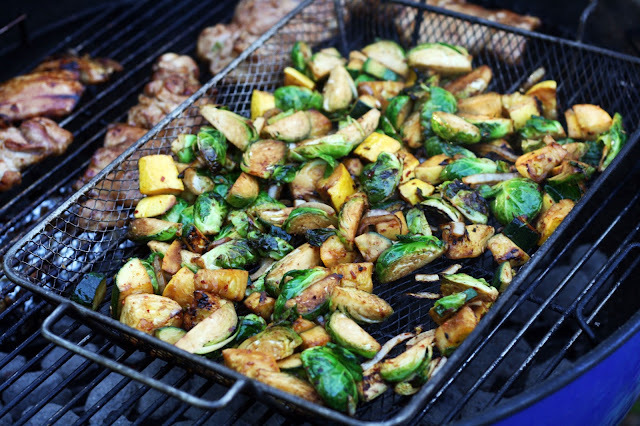 The zucchini, yellow squash, Brussels sprouts and onions all still had a bit of a bite to them but wonderfully charred edges and a pleasant smoky flavor. Despite the spice-packed ingredients there was just a gentle heat to the dish, enough to keep it interesting but not enough it was overwhelming. Don't be tempted to eliminate the oil, it is what keeps the veggies from sticking to the grill pan and a lot drips off so no worries--the dish isn't greasy at all.